On the first day of Zoo Camp the kids always pick what animal their group will be. Last year, Kidlet was in the Green Group and they chose to be the Sloths. On the second day of camp I made him a sloth bento of course! So this year I was very excited to find out what animal I would be making on the second day of camp! His group color this year is purple and.......they chose to be the Narwhals. My reaction to this news looked something like this: ?! 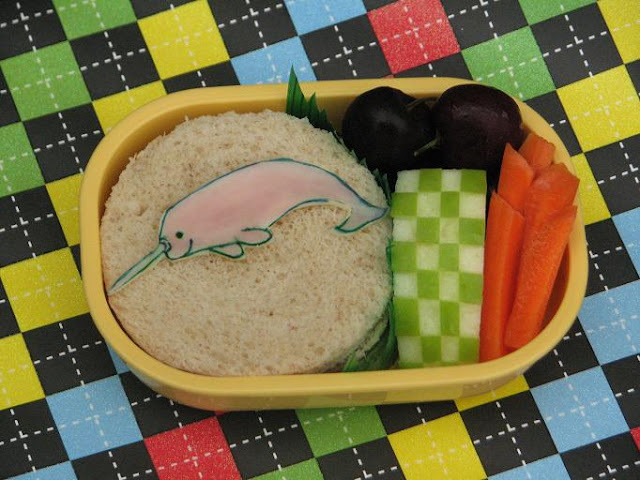 @#(@&$&#^ I have no idea what made someone suggest a Narwhal or what made them all vote for it....but they are the Purple Narwhals and naturally Kidlet felt I was up to the job of representing this in bento form. Here we have a Purple Narwhal made from cheese and food color sitting on top of a soy ham sandwich. On the side are cherries, checkered apple, and carrots. Haha! Good job with the mysterious Narwhal! I can safely say I have not thought about a narwhal since I was in grade school, so thanks for the flashback! That is an awesome Narwhal. What a great challenge :) This is actually the second time today that Narwhals have come to my attention. I wonder if that means anything, lol.